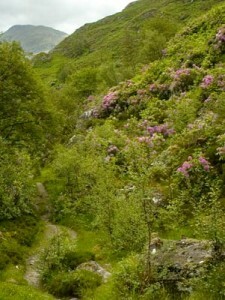 There are many hundreds of species of Rhododendron, many of which produce impressive floral displays. They belong to the plant family known as the Ericaceae, which includes the azaleas, heathers, cranberries, and blueberries. Plants in this family can form mycorrhizae. These are symbiotic root associations with fungi; these help in the uptake of minerals, which probably explains why such plants can compete successfully in poor soils. Many different species of Rhododendron have been introduced into the UK but to date only one of these, Rhododendron ponticum, has become invasive. At one time, Rhododendron ponticum was to be found across most of southern and western Europe. There is evidence that it flourished in Ireland during the Gortian or Hoxnian Inter-glacial – a warm period many thousands of years ago. Nowadays, its natural distribution is much more limited; growing around the south of the Black Sea and in parts of Spain and Portugal. 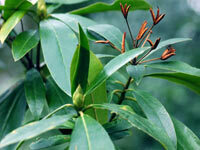 It is a tall, evergreen shrub with elliptical, somewhat leathery leaves. It produces masses of violet purple flowers (between April and September), and is now to be found in woodlands, alongside rivers and on heathland across the UK. R. ponticum was introduced into the U.K in the 18th century, probably using stock gathered in Spain or Portugal. Like many other introduced species, it was used in the planting of country estates and gardens. 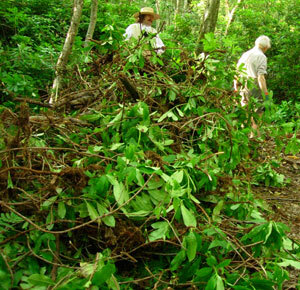 However, during the succeeding two hundred years, it has spread and is now destroying native plants in many areas. R. ponticum can reproduce by seed or vegetatively. A mature plant can produce hundreds of flowers; and each flower head can form between 3000 and 7000 seeds. Thus, a single plant may release millions of seeds. These seeds germinate well in areas where the ground has been disturbed or is covered with moss. The young seedlings establish their association with soil fungi – which enables them to do well in nutrient poor soils. The plant spreads asexually as when its branches or shoots come in contact with soil, they form roots. This ability and its sideways growth habit means that it can spread even into unfavourable areas. It forms large stands of vegetation, which create dense shade. Consequently, many species in the ground layer of plants are simply shaded out of existence, and many trees species cannot regenerate under such a canopy. There is some evidence that as it grows this Rhododendron produces chemicals which inhibit the growth / germination of other species. This phenomenon is known as allelopathy. When Rhododendron ponticum is in flower, it may ‘monopolise’ the pollinating insects to the detriment of other species in the vicinity. Wherever this plant invades, there is drop in the biodiversity of the area, not only because of the loss of plant species but also of insects and other invertebrates. Removing R. ponticum and restoring areas is not easy. Herbicide treatment may need to be repeated over a number of years. Physical removal may require manual labour as opposed to the use of machinery because of the risk of damage to other trees / vegetation. Even when the plants have been removed, the area may remain ‘barren’ because of the toxic layer of humus (formed from the decay of its leaves) that builds up underneath the shrubs. This humus rich layer may have to be removed before natural vegetation can re-establish itself. The area also needs to be monitored to ensure that recolonisation, by means of the millions of dispersed seeds or plant fragments, does not occur. Many woodland owners like to have some Rhododendron ponticum in their wood and they argue that it provides some winter cover for birds and the colourful flowers add welcome variety in the summer. This more open-minded approach is fine but if your Rhododendron ponticum gets out of hand your neighbours can complain, and if you do like having Rhododendron in your woodland it might be wise not to shout too loudly about it! There are two ways in which plants can help reduce global warming, by fixing carbon dioxide and by reflecting radiation back from the earth’s surface. Could I suggest Miscanthus as being a candidate for the first, not sure on the latter whether there is much difference bewteen species in reflectivity. Miscanthus grows on marginal quality soils and can be used to replace fossil fuels. However the conservationists need the marginal soil for nature conservation so the biofuels can ‘get off our land’ and save it for nature. The point being that with climate change plants will need to migrate and they will need the space with which to do this! I don’t think there is an ideal plant for each of those concerns. Biodiversity cannot be achieved through the cultivation of one plant, but rather through respect for nature’s own processes. For example, allowing ancient and veteran trees to remain to encourage insects. In other words, resisting the urge to tidy up! Encouraging birds, planting native trees and wild flowers, keeping old wood to encourage fungi and insects, composting etc. etc. The London Wildlife Trust has some interesting information on how to encourage biodiversity in your own garden. As for global cooling – I have no idea! Perhaps someone else can help..?! Obviously it needs control even though it is beautifull and a member of the wonderfull Ericaceae. Does anyone know which species of plant contribute most to global cooling and which to biodiversity?